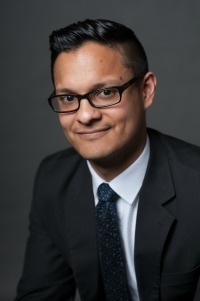 Robert Vargas, a Notre Dame assistant professor of sociology and faculty fellow in the Institute for Latino Studies, has won a book award for his ethnographic study of Chicago’s Little Village neighborhood and its confrontational relationships between police, politicians, and gangs. The Academy of Criminal Justice Sciences will present its Outstanding Book Award to Vargas at its annual meeting in March in Kansas City, Missouri. Vargas’ book, Wounded City: Violent Turf Wars in a Chicago Barrio, explores the hazy boundaries between Chicago politicians’ turf and gang turf. He argues that competition among political groups can facilitate the persistence of violence just as much as competition among street gangs does. He also contends that city ward boundaries were deliberately drawn to undermine the political power of poor residents, and those political acts resulted in undermining collective efforts to reduce violence. This ACJS award recognizes a professional’s contribution to criminal justice as an academic or professional endeavor, and its recipients have made substantial contributions to the emerging body of knowledge in criminal justice. Previous recipients include Robert Sampson of Harvard University and Wesley Skogan of Northwestern University. Vargas, whose research as an urban sociologist focuses on violence and health, joined the Notre Dame faculty in 2016. He previously was on the faculty at the University of Wisconsin-Madison and completed a postdoctoral fellowship at Harvard University’s Robert Wood Johnson Foundation.